My personal selection for Stereophile‘s 2018 Product of the Year was the super-resolving, highly-involving TAD Micro Evolution One loudspeaker ($12,495). I heard it first at a MoFi demonstration at an audio show. Wherein I repeated the words “wow” and “my god” over and over. Think goosebumps and awe. But I never thought, or imagined, how much more fleshed out and expansive the ME1s could sound with another octave of energy at the bottom. This year, in the second Tenacious Audio room, the $27,995/pair TAD Evolution E1TX-K loudspeakers produced a much larger and more forceful energy field—with an enhanced octave to octave tonal balance. The E1TX-K’s dual 7″ woofers and CST coaxial mid-tweeter array delivered an extremely beguiling transparency. 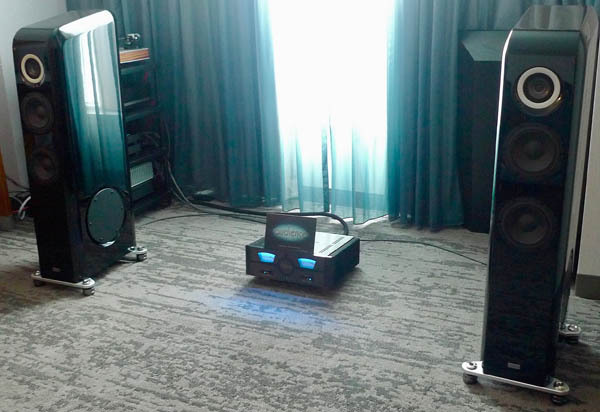 The rest of the system included: Wolf Audio Systems Alpha 3 Music Server ($7100), a TAD DA1000 DAC ($13,995), an Audience power conditioner ($7995), and Audience SX interconnects, speaker cables, and power cables. [Amplification was the new Coda Technologies model 8 amplifier ($6200) and 07x linestage ($6500). – ed.] All that fancy gear sat on a SolidSteel rack.